The PADI Divemaster internship Go Pro 4, in Tenerife, is for those divers who already have some experience and have obtained the PADI Advanced Open Water Diver or equivalent, with a minimum of 30 dives. 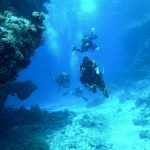 After completing the PADI Rescue diver course and Emergency First Responder courses, you then go on to the Professional course of PADI Divemaster. The course not only develops the candidate’s diving knowledge through independent study and classroom discussions, but also addresses attitudes, judgement, customer service, business and operational challenges. Watermanship and stamina are evaluated together with diving skills, which will be developed to demonstration quality. Candidates will underwater mapping exercise as well as demonstrating their skills in dive planning and leadership. They will also function as an instructional assistant, both in confined and open water. Completion of this course qualifies the candidate to attend either a PADI Assistant Instructor (AI) course or a PADI Instructor Development Course (IDC) which eventually leads to the certification as a PADI Open Water Scuba Instructor. A PADI Advanced Open Water Diver (or qualifying certification from another training organization). Have at least 30 dives to begin the course. Be available for 3 weeks in Tenerife. All your required PADI manuals and training materials are included. FREE loan of Scuba Diving equipment for the entire duration you are with us.